1. A network administrator is preparing the implementation of Rapid PVST+ on a production network. How are the Rapid PVST+ link types determined on the switch interfaces? 2. Which spanning tree standard supports only one root bridge so that traffic from all VLANs flows over the same path? 3. What is the outcome of a Layer 2 broadcast storm? 4. Which protocol provides up to 16 instances of RSTP, combines many VLANs with the same physical and logical topology into a common RSTP instance, and provides support for PortFast, BPDU guard, BPDU filter, root guard, and loop guard? 6. Which three components are combined to form a bridge ID? 7. Refer to the exhibit. 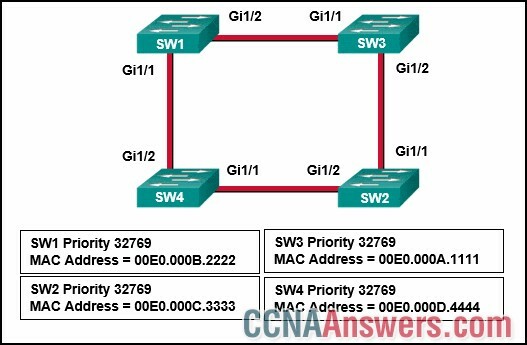 What is the role of the SW3 switch? 8. Open the PT Activity. Perform the tasks in the activity instructions and then answer the question. Which switch is the root bridge? 9. If no bridge priority is configured in PVST, which criteria is considered when electing the root bridge? 10. What is a characteristic of a Layer 2 loop? 12. What port type is used to interconnect switches in a switch stack? 13. Fill in the blank. Do not use abbreviations. 14. Which port state will switch ports immediately transition to when configured for PortFast? 15. What additional information is contained in the 12-bit extended system ID of a BPDU? 16. Which RSTP ports are connected to end devices? 18. 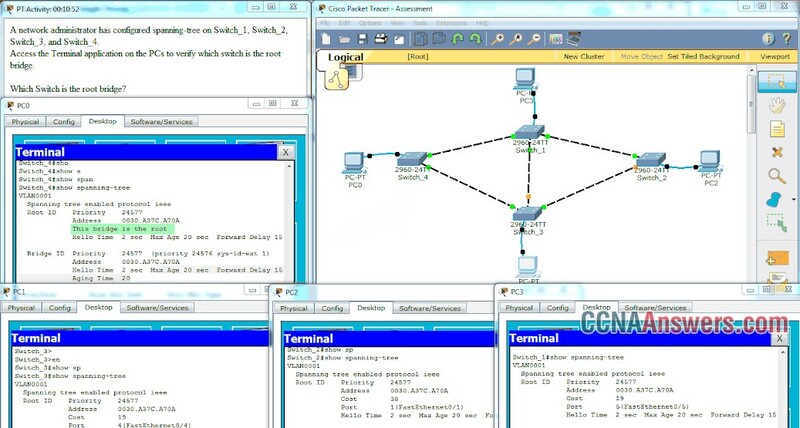 Which Cisco switch feature ensures that configured switch edge ports do not cause Layer 2 loops if a port is mistakenly connected to another switch? 19. Which STP priority configuration would ensure that a switch would always be the root switch? 21. Refer to the exhibit. Which trunk link will not forward any traffic after the root bridge election process is complete? 22. 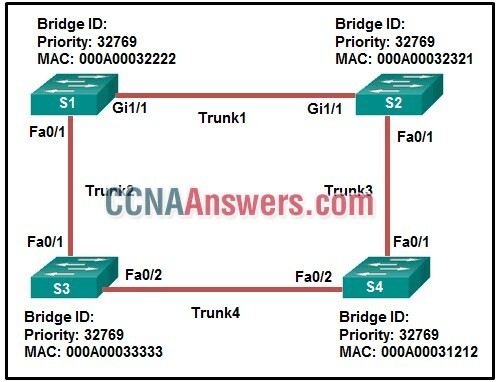 What is the purpose of the Spanning Tree Protocol (STP)? 23. What is an advantage of PVST+?